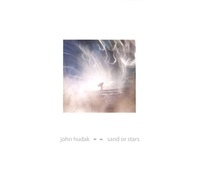 Comparisons between the sand of the earth with the stars above are many, but comparisons of this release by American composer John Hudak with his previous work are far less to be found. The first piece of this CD mastered by John's friend and collaborator Stephan Mathieu (Sirr.ecords, Lucky Kitchen, Hapna, etc), is unlike much of John's previous work in that it features sharp staccato percussive sounds suddenly dodging in and out, but nevertheless it still has John's "endless" compositional sense written into it. A subtle sense of humor seems to be inherent in the piece as well, as if some of the sounds hesitate with indecision as to whether or not they should make their presence known or perhaps they are trying to avoid colliding with some of the other sounds. And upon listening to this piece, be careful with volume settings at first listen, because the listener will quickly discover another aspect of this piece that is unlike much of John's previous work: sudden volume shifts. This seems to suggest that the sounds are also changeable in temperament as well! The second piece on this CD is perhaps the most meditative of the collection with its muted midrange buzzing that jumps around within the stereo spectrum, perhaps being reminiscent of musical radar signals or sonifications of normally inaudible activity occurring in a planet's magnetosphere, all the while maintaining a benevolent warmth throughout. And what could possibly be described as the amplification of rolling ion particle blasts being broadcast via shortwave radio, tells us that we have reached the third and final piece of this collection of what could be considered as being among John Hudak's finest works.